These two women could not be on the same bus. A video popped up on YouTube Thursday morning that is sure to get attention. It shows a nasty verbal fight between two women on board a Muni bus. After exchanging profanity-laced verbal insults, the fight turned physical. While male passengers stood and watched, women stepped up to break up the fight. One young woman put her body between the two ordering them to stop. The fight moved down the aisle as the two women struggled to claw and kick each other. It was unclear when the fight happened, but the video was uploaded to YouTube on Thursday. 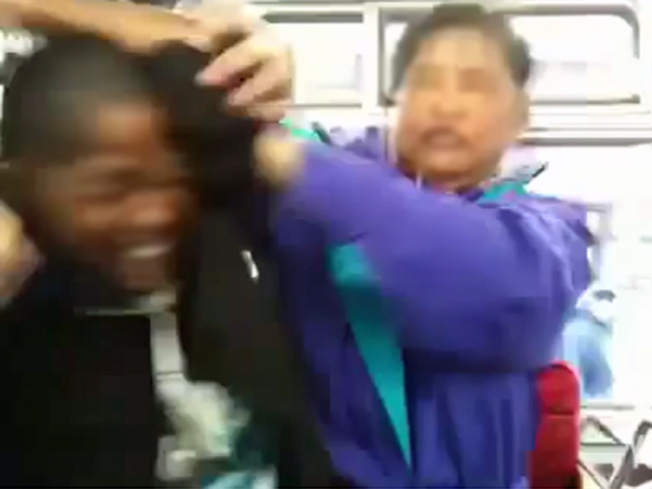 The person who taped the altercation started it with by saying, "Just another day on Muni." He told NBC Bay Area that he was attacked on the same bus three weeks ago. He said he reported that attack to the bus driver, who tried to call it in but could not get anyone to pick up. He said the driver kept making stops and soon his attacker got off the bus. Although that passenger left his name with the Muni driver, he said he never heard from Muni or police. Muni officials say drivers are supposed to report all incident to central control who will in turn call police. There is no evidence this incident was reported to either, but the vehicle in question was a 60 foot extended bus and it is possible the driver was unware of what was happening in the back. Both the driver and the incident are currently under investigation, according to Muni. The Muni Diaries Blog had someone interpret Cantonese that was spoken by other passengers during the argument. A fellow passenger was apparently egging one of the women on by saying, "Hit her, hit her, hit her. Hit her until she’s afraid.” Other portions of the yelling (in English) included the old standby: "F--k you" repeated a few times and a grade-school playground favorite: "You are stupid!"